If you've sustained an injury to the forearms in the past, it's important that you protect them to avoid future discomfort. The Towa ActivGrip 26cm Liquid Resistant 567 Gloves feature heat-sealed PVC Sleeves that are reinforced to prevent tears and punctures while also protecting your forearms against water and oil. 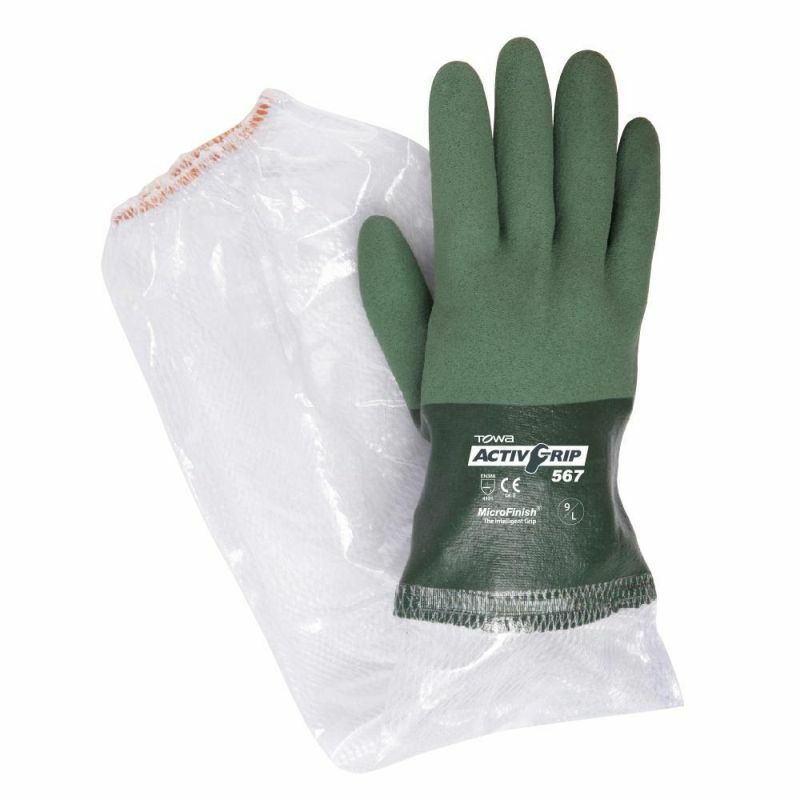 The gloves are coated in nitrile to protect your hands against liquids, oils and mechanical risks for improved safety. These are designated Category II gloves, meaning they should be suitable for most medium-weight tasks. The gloves are fully coated for all-round protection against liquids, oils and mechanical hazards. The gloves are highly flexible, making them particularly suited to handling tasks in wet and oily conditions. Find out more about the MicroFinish technology used in these gloves by watching the video below. Using this patented coating technology, the gloves provide excellent grip! The Liquid Resistant 567 Gloves are available in four sizes to fit most hands. Please measure the circumference of your hand around the knuckles (excluding your thumb) with your palm open and your fingers together. These gloves are 26cm (10") in length for excellent wrist protection.